This massive version of "the comforting basket" has even more gourmet goodies for the grieving family and their guests to enjoy along with comforting gifts to help show your support. 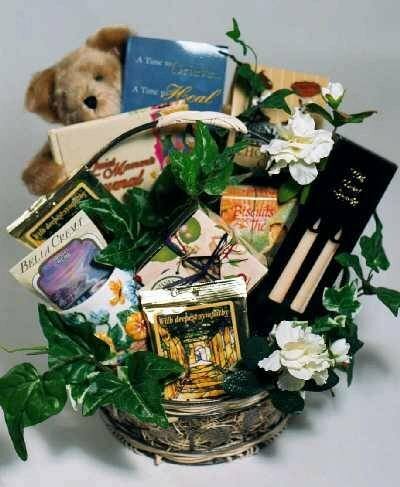 This over sized gift basket includes a book titled "a time to grieve" a time to heal" by Dr. Criswell freeman, which offers a collection of meaningful quotations and advice from grief counselors, spiritual leaders, and great thinkers, also offered is the "quiet moments" grief journal which may help them to begin to heal by expressing their thoughts and feelings on paper, Sebastian the bear has been added because he is an expert at snuggling, a large ceramic coffee mug, gourmet coffee, two Dutch chocolate cocoas that read "with deepest sympathy", tea biscuits, a box of jumbo cashews and chocolate chip pecan cookies (a great comfort food), butter toffee pretzels, a mixture of dried fruit and assorted nuts, golden walnut cookies with a creamy caramel center, caramel corn, Jordan almonds, chocolate pecan tea cookies and coconut white chocolate cookies, gourmet crackers and cheese, 2 types of cappuccino each elegantly packaged in mug shaped boxes, "thinking of you" gourmet snack mix, authentic parmesan bruschetta crisps, cinnamon almonds, pistachios, an additional mug and another comforting teddy bear. This bountiful gift basket is truly breathtaking.